Harvey Milk, the inspirational gay rights leader had a triumphant and tragic life. Just by the nature of his unique name, I was aware of the man, yet I knew nothing of him. Milk was to the gay rights movement in the 70’s as Dr. Martin Luther King Jr. was to the Civil Rights movement in the 60’s – a man whose life was dictated by his movement, and whose life, in death, became synonymous with the cause. By coincidence with the shocking reversal of the gay marriage laws in California, Harvey Milk is as relevant now as in 1978. Gus Van Sant, one of the most consistently intriguing independent filmmakers working today is the ideal man to bring this story to the big screen. His career has shown range even broader then Danny Boyle's - from quality schmaltz like “Good Will Hunting” to intensely personal and experimental art statements like “Elephant” or “Last Days”. And really, does anyone want to see Ron Howard or Steven Spielberg make this story? In “Milk” Van Sant exercises his “Good Will Hunting” muscles executing an inspirational political biopic which reaches the dramatic high bar it needs to reach to do justice to his cause. Van Sant, working from a script by Dustin Lance Black, condenses the years of 1970 to 1978. 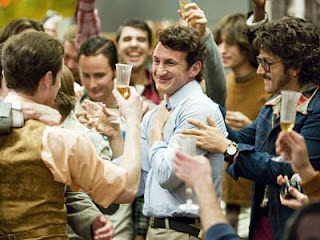 Sean Penn plays Harvey Milk, a local camera store owner in the Castro district of San Francisco who single handedly creates the gay rights movement and becomes the first openly gay elected official in California. We meet his colleagues and lovers who he befriends and alienates in the name of the cause. We see the political battles in front of and behind closed doors and the sneaky deals and backstabbing it takes to create action. Van Sant appears to have watched some of the great biopics to both borrow from and improve upon in telling the “Milk” story. Fans of his phenomenal experimental work of the past five years may be disappointed with how traditional he is. Van Sant frames the story with a familiar 'narration in the present'/'flashbacks to the past' method of storytelling. In order to condense eight years of time inevitably this leads to an episodic feel. But Van Sant’s visual skills minimize this as much as possible. Perhaps inspired by the work of Oliver Stone he smartly uses as much archival footage as possible to set the scene and put us in the time and place of 1970's San Francisco. (Coincidentally, it's shot by Harris Savides who also shot David Fincher's epic San Fran film, "Zodiac"). His careful shot choices and creative editing elevate the stock footage use beyond mere exposition. Yet even within the most traditional scenes Van Sant finds a way to frame a dialogue scenes with his unique artistic sensibilities. Take the first scene when Milk picks with his longtime lover Scott Smith (James Franco). It’s a classic courtship scene, shot in a two-shot profile with a unique angle to the camera. It’s barely noticeable, just enough a tilt to make us pay attention. Van Sant assembles a superb cast of actors who get intimate with each other and the audience. Sean Penn is near-pitch-perfect as Milk. And rest assured, Van Sant keeps Penn’s tendency to go over-the-top in check. In a couple of scenes toward the end Penn does let loose like only he can, but by the time they come we believe 100% he is Harvey Milk. Jame Franco, Emile Hirsch and Diego Luna all give sympathetic and inspired performances, but once again, it’s Josh Brolin who comes in and steals his scenes as Milk’s sometimes friend, sometimes political enemy, Dan White. Kudos to Van Sant and Black for not letting the antagonistic aspects of his character run away turning him into a ‘villain’. It’s a very special and important role. By using his “Good Will Hunting” muscle its apparent Van Sant’s goal is to get mainstream audiences to watch and learn from the film. In the final act, Van Sant hits the right buttons and maximizes the impact of the tragic end of Milk’s short life (note, this is not spoiler, this is told to us in the very first scene). And so the timing of “Milk” with current events is a stroke of decent luck, but it’s an uphill battle to sell a gay political film biopic to mainstream America. Enjoy. I predict Sean Penn will win some rewards with this film. I've always been a fan of his work. You learn a lot by watching this film and leave the theater inspired. Loved it! I HYPED Milk on EverHYPE and scored it 93%, which I think is very accurate. If you get on there, rate me a 5 on it and request friendship.